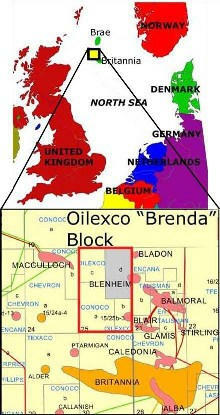 Summary Joint AI-GI stochastic seismic inversion was performed for 100 pairs of equi-probable AI-GI realizations over the Brenda field, which is located in block 15 in the North Sea. Stochastic inversion enables the possible variability in impedance, and hence the uncertainty in lithology and fluid classification, to be explored. These can be represented using probability and connected probability volumes calculated using joint AI-GI thresholds. Rock Physics Analysis Careful data preparation is required for any type of seismic inversion. Below is a summary of the complete stochastic inversion work-flow: • Perform well ties and wavelet estimation • Zero-phasing and spectral balancing of the near and far angle stacks • Compute AVO intercept and gradient stacks • Coloured inversion for relative AI and GI impedance volumes • 3D variogram analysis • Kriging for initial AI and GI models • AI and GI deterministic inversions • Generate 100 AI-GI realizations using joint stochastic inversion • Generate sand and hydrocarbon probability volumes using an impedance classifier The figure on the right shows an AI-GI crossplot for nine wells which has been rotated so that the sand-shale trend is aligned with the rotated GI axis. Impedance thresholds on rotated GI were used to indicate different lithologies. 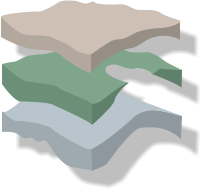 Four lithology types were identified: shales, shale- sands, high porosity sands and low porosity (cemented) sands. Joint impedance thresholds on rotated AI-GI were used to indicate hydrocarbons. The figure on the right shows the rotated AI-GI crossplot coloured by water saturation. Suitable impedance thresholds for oil sand identification are indicated by a red square. Variogram Analysis and Model Building 3D variogram models are required for kriging initial (background) AI-GI models. Vertical variograms are calculated from the AI and GI logs (in time). Although sometimes well logs can also be used for horizontal variogram analysis it is often the case that there are too few pairs of wells with separations less than the variogram range to properly characterise the variogram shape. We therefore performed horizontal variogram analysis on horizon slices through the AI and GI coloured inversions. 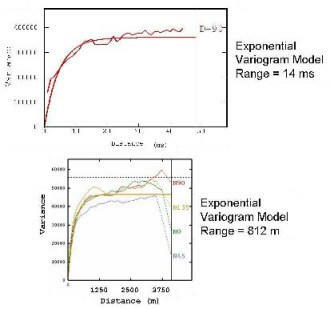 Exponential variogram models with ranges of 20 ms (vertical) and 1000 m (horizontal) were used. Deterministic and Stochastic Seismic Inversion Deterministic AI-GI inversion was performed, enabling us to test the wavelets and inversion parameters before proceeding to stochastic inversion. The resulting AI deterministic inversion is shown in the figure. Deterministic inversion represents a smooth best estimate of impedance, the resolution of which is limited by that of the seismic data (Francis, 2006). In order to capture the possible AI-GI variation away from well control 100 realization pairs were generated. The figure shows the mean of the 100 AI realizations. At a well location the impedance logs provide additional information that is not contained in the seismic data (since it is beyond the seismic bandwidth). Since stochastic inversion honours a spatial correlation function (variogram model), impedances near a well location are statistically related to those at the well. Therefore less than the range of the horizontal variogram (1000 m) from a well the impedance logs provide additional information about the possible impedance values. This additional statistical information results in the mean of the stochastic realizations having a higher resolution than the deterministic inversion close to the wells. However away from the wells the mean of the stochastic realizations is almost identical to the deterministic inversion, the resolution of both being limited by that of the seismic data. The effect of the well information on reducing the uncertainty in the stochastic realizations near the well locations is demonstrated by the figure which shows the standard deviation of the 100 AI realizations. The lowest standard deviations are observed near well locations while the largest standard deviations occur at depths where there is little well control. Probability and Connected Probability Analysis The stochastic realizations were used to derive sand and oil sand probability volumes based on impedance cutoffs. The figure below shows a sand probability section based on rotated AI- GI cutoffs. The inserted logs are porosity and water saturation respectively. The stochastic realizations were used to derive sand and oil sand probability volumes based on impedance cutoffs. 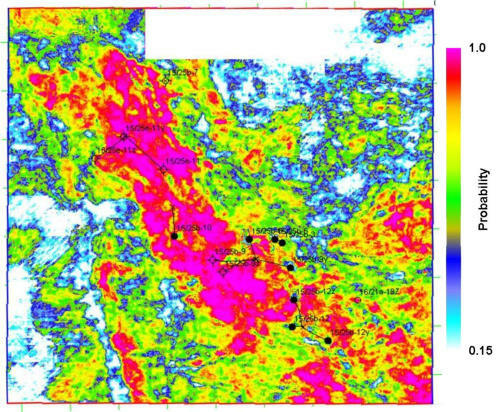 The figure below shows an oil sand probability section based on rotated AI-GI cutoffs. The inserted logs are porosity and water saturation respectively. The stochastic realizations were used to derive sand and oil sand probability volumes based on impedance cutoffs. The figure shows a sand probability map at the reservoir level. Connected volumes were also analysed and displayed as connected probability volumes. Seed locations for connected probability analysis were based on recently drilled production wells. The figure shows a section from a connected oil sand probability volume. Inserted logs are water saturation. The location of a seed point in this section is indicated by a red dot. Connected volumes were also analysed and displayed as connected probability volumes. Seed locations for connected probability analysis were based on recently drilled production wells. The figure on the next page shows maximum and mean connected probability maps. 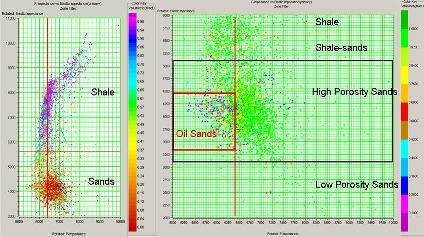 The maximum probability map indicates the maximum probability of oil sand occurring within a given time window, while the mean probability map gives the average oil sand thickness over the 100 stochastic realizations. Connected volumetric analysis was also performed. The range of mean probability colour bar corresponds to 0-9 ms average oil sand thickness within the 40 ms window. The locations of the four seed points used are indicated by red dots Conclusions Stochastic inversion enables the uncertainty in seismic inversion to be explored. Additional information in the well logs is statistically exploited in accordance with the variogram model. A sufficiently large number of stochastic realizations enables probability and connected volumes corresponding to lithology or fluid indicators to be generated.